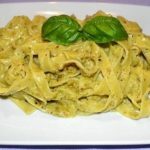 Pistachio pesto fettuccine: Pistachios are one of the most ancient flowering nut trees and are native to the Middle East. Pistachio nuts can be very expensive so using them to make a pesto will help you make the most out of a small amount. Most pasta dishes served in Italy do not need too many ingredients to make them work. 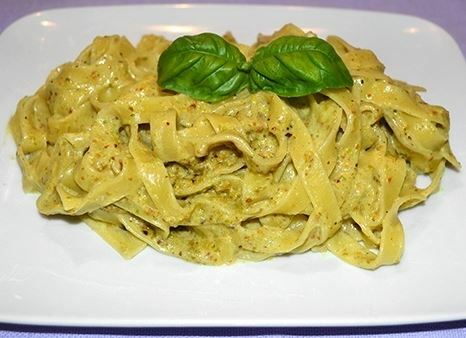 The combination of basil, ricotta and pistachio here makes a creamy sauce that is best suited with fettuccine pasta. 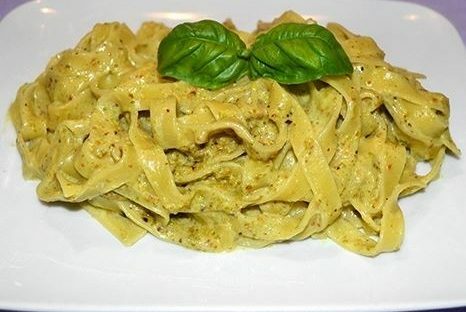 Pistachio pesto fettuccine is very taste and beware … addictive. In a food processor, mix and chop everything together then gradually add the oil in a thin slow stream until the mixture is creamy and smooth. Bring a large pot of lightly salted water to a boil, add the pasta and cook as instructed.